Fluorescent lights and plants in the UK. Growing plants under fluorescent lights enables you to start the growing season two months or more earlier than other gardeners in your area. It enables you to grow plants to from cuttings rather than from seed or purchased at the nursery. Growing plants under special lights is common amongst commercial growers and it is the the key to their success. You too can have this advantage for a modest cost. 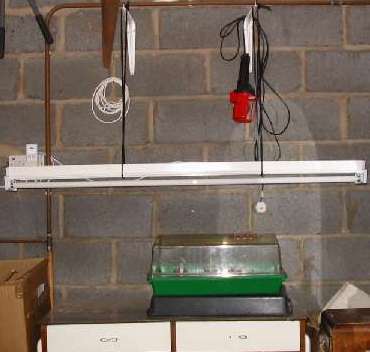 There is some basic equipment and facilities needed to grow plants under fluorescent lights - these are detailed below. If you can provide these, please have a go. GardenAction has proven that the system works for the average gardener and we will be happy to answer any questions you have (contact us). 1. A garage which can be enclosed on all sides (it must have a closeable door at the front). It must have a standard electrical socket to power the lights. 2. A table, minimum width 1.5 metres (5 foot), depth 0.75 metres (2 foot). The table will get wet and dirty so the best option is to head for your local waste dump and buy one for a fiver. An alternative is to buy the cheapest one you can find using the ads in the local newspaper. 3. Fluorescent light unit (not the actual fluorescent light tube). This is the part that holds and powers the fluorescent light tube. These can be purchased from your local DIY shop and will cost about �15 new. Note that if you buy a new unit, it will almost certainly come with a fluorescent light tube as well. Unfortunately the tube will not be of the correct type for growing plants. If you can locate a safe second hand unit, it will cost roughly a fiver. 4. A 'warm white' fluorescent tube. The operative words here are 'warm white' - these are not as common as the standard fluorescent lights used in most homes. However, they are readily available in many of the larger DIY stores (ours were bought from B&Q). 'Warm white' refers to the spectrum of light emitted by the tube - in all other respects (size, electrical connections), the tubes are exactly the same as standard fluorescent tubes. They cost around �5. 5. A method of suspending the light unit 18 to 24 inches (50 to 60cm) above the table. Each individual situation will need a different solution. Do ensure whatever solution you utilise, that it is electrically safe. If in doubt consult a qualified electrician. 6. A length of electrical flex and an electric plug. These will be used to connect the fluorescent light unit to the electrical supply. Again, if in any doubt, consult a qualified electrician. Message: Who can adise on grafting tomatoes?